Perhaps "real" is a figment of our imaginations. Between network news, blockbuster movies, airbrushing, and fiction novels to our favorite foods, who can tell what's real and what's not anymore? How often do you meet someone who asks, "How are you?" And how often is your response, "Fine." Do people actually want to know what's really going on with you? Would they run away screaming if they did? If we go long enough not being real with anyone, chances are we'll forget what "real" even is. Sometimes it's even hard to be real with ourselves. A couple of really big crisis moments in my life forced me to face "real". Being real means being honest. I realized quickly that the things I was hiding were eating me up inside. Hiding my real allowed lies to invade. Lies that convince you that you are the only one. Lies that isolate you and leave you very lonely. 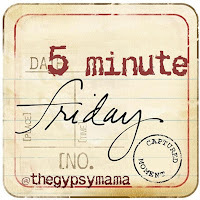 We wrote about "Community" in last week's FIVE MINUTE FRIDAY. And being real has a lot to do with having genuine community with others. I want to know that I'm not the only one who hates doing the dishes and leaves them piled high sometimes. I want to know that other couples argue like we argue. I want to know that other people don't find intimacy as easy as they depict it in the movies (insert eye roll here). When we share, we invite people into our lives. When we are real, we let other people know they aren't alone. Realness shows me that we are all very much a like. I don't want to know how perfect you are or how perfect you want everyone to think you are. We all struggle with something. We all have good days and bad days. Chances are the truth about your life is not much different then mind. Let's share the burdens and the blessings instead of keeping them locked inside. There are different levels of "real". And it can start with an honest answer to the "how are you" question. If you aren't fine, don't let yourself say that you are. If people don't know what to do with your answer, so what. Take off the mask! I want to know the real you and I'm willing to bet others do, too. I very rarely tell someone exactly "how I am today". It's mostly because I carefully choose who I want to reeeaaaalllly know that! You have a beautiful family! I think you are awesome for homeschooling, too! Not everyone is trustworthy enough to handle your deepest issues. But if you aren't okay, I don't think you have to pretend that you are. I believe there are very positive benefits to being real with people, as I explained in my post. Thank you for visiting and sharing your thoughts! I hope you'll come again soon! PS- Thanks for your encouragement, but I actually don't homeschool. My children are both in our local public school.